With Memorial Day weekend on the horizon, many people with green thumbs are preparing to put their saplings and seeds into the ground — the beginnings of this season’s garden. It’s usually the same old stuff: tomatoes, green beans, peppers, berries, carrots. But this year there will be an exciting, new addition to many home gardens: the gloriously stank-n-dank flower cannabis. Massachusetts is in a hazy space with marijuana at the moment. Recreational use has been legal since December 2016, but the state has yet to green light the sale of weed for nonmedical purposes. There’s a state commission figuring out how to regulate and tax. Sales are not expected to begin until at least 2018. In the meantime, people 21 and older can grow up to six plants at home for personal use. Unless you have a generous friend with a spare ounce, growing your own stash is the only way to legally obtain recreational pot in Massachusetts. Growing marijuana isn’t the same as growing beans, though. There are measures a cannabis enthusiast can take to ensure a nice harvest. To learn more about cultivating weed at home, I got in touch with medical marijuana consultant Ezra Parzybok of Northampton and cannabis artist Marty Klein of Easthampton. Together they both have, let’s just say, “many” years of experience growing weed. Parzybok has also had the unfortunate experience of having his at-home marijuana grow raided. While growing marijuana in Massachusetts is legal, there is risk. Parzybok’s home was raided in 2015 and he was charged with two counts of possession with intent to distribute marijuana. He pled guilty in exchange for 90 days of unsupervised probation. But before we begin, some ground rules: While in Massachusetts it is legal to grow up to six marijuana plants per person — and there can be no more than 12 plants per residence — it is still illegal at the federal level. All marijuana plants must be kept in a secure, locked space that is not in public view. Got that? Then let’s go! Seeds: Obtaining the seeds can be the trickiest part of the grow. It’s not like you can go to the nearest garden center and pick up a pack. This means someone has to gift growers their seeds or they have to purchase them online from a retailer in another country. The legality of buying online from places like Spain, Canada, and Holland are iffy. Parzybok says most of the time online seed-sales come with the disclaimer “for souvenir purposes only,” a loophole that allows for the sale. “There isn’t enough THC in the seed to make it illegal,” he says. Klein says he’s aware of a local cannabis seed exchange, but likes the selections provided online. Klein says he has seen seeds sell for $15 each. When compared to the value of the marijuana the seed produces, however, it’s a bargain. He also noted that many seed dealers sell auto-flower seeds, which are easier to use than traditional seeds. Outdoor/Indoor: It’s cheaper to grow marijuana outside with the sun providing all the light the plants need. Parzybok has his grow in pots he keeps inside a converted, portable dog kennel. When looking for a place in the yard to plant, find a spot that gets a lot of sun. The plants can be grown in the earth or in pots. Both Parzybok and Klein suggested home growers stop by their local hydroponic shops to get advice on equipment and nutrients for the soil. For an indoor-grow, a small space like a closet is best; it will be easier to maintain a good balance of humidity and temperature. It also will allow the grower to control how much light the plants get, which dictates when the cannabis will flower. The rule of thumb for growing inside, according to Parzybok, is: 30 watts of light per square foot in the growing-stage, and 40 watts of light per square foot for flowering. Keep the humidity at 50 percent, he says, and the temperature at 75 degrees during the day and 65 at night. During the grow phase keep the light on 18 hours a day. When it’s time to flower, do 12 hours of light and 12 hours of dark. Trim smaller, bud-less branches to force more of the plant’s energy into producing marijuana flowers. The whole cycle, all the way to harvest, takes about four months. The harvest: Marijuana is ready to harvest when your patience runs out and you start cutting the sucker up. Or at least that’s been my experience. 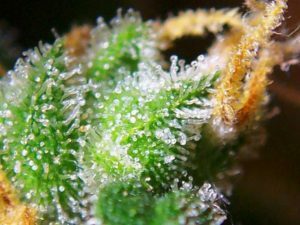 Klein, however, says the plant is ready for harvest when the “trichomes” are milky white, with just a few of them turning amber. Klein is a scanographer who likes to focus on cannabis, so he’s spent a lot of time looking closely at trichomes. The color of the balls can be observed with a pocket magnifying glass, he says. “You generally harvest when the plant is hearty and just a few amber [balls] are showing,” Klein says. Parzybok and Klein estimate that most home growers invest a couple hundred into their operations: spending the money on security, fertilizer, lightbulbs, and nutrients. While growing can be done for cheap, the yield may not be as heady. This is the most down and dirty how-to-grow column I think I’ve ever read, and certainly, written. Both Parzybok and Klein were skeptical of my ability to distill the gigantic topic of home growing into one article. I know I’ve left out a lot and there are more tips to share — Parzybok and Klein gave me far more tips than I didn’t have the room to write down here. So let’s keep this grow conversation, uh, growing. Send in your tips and questions about growing to editor@valleyadvocate.com. I’ll try to get them answered and share the knowledge in this space. Kristin’s not here, man, but you can contact her at editor@valleyadvocate.com.